This page is available for Institutions/Consultants inside the US and Financial Professionals inside the US and Individual Investors only. Real estate remains significantly underrepresented in DC plans compared with the sizable allocations in most corporate and public pension plans. The $1.7 trillion global REIT market offers a wide range of opportunities to invest in different property cycles, macroeconomic trends and interest-rate environments. REITs have historically helped to enhance a portfolio’s risk-adjusted returns due to low correlations with stocks and bonds, attractive total-return potential and inflationhedging characteristics. Institutional investors have long recognized real estate for its history of attractive returns, stable cash flows and low correlations with other asset classes. For these investors, real estate has typically been a significant long-term allocation, generally in the 5–15% range. By contrast, the defined contribution (DC) market has been slower to adopt real estate and other diversifiers, focusing predominantly on core equity and fixed income strategies. According to financial data company Brightscope, only 45% of DC plans with at least 100 participants offer real estate in their investment menus. Among those that have it, allocations have averaged just 2% of plan assets. This is consistent with other data showing that overall real estate allocations across all DC plans are under 1%—well below levels found among institutionally managed defined benefit (DB) plans and other large investors (Exhibit 1). We believe the low prevalence of real estate in DC plans presents an opportunity for providing both broader availability and greater participant education on the potential benefits of real estate exposure, bringing the best of DB practices to DC plans. As the DC industry continues to evolve, many plan sponsors are recognizing the need to give participants access to more diversified investment choices to increase the chances of achieving their retirement income goals. This task has taken on greater urgency in recent years, as many participants are finding themselves behind in their savings targets, yet faced with the prospect of substandard market returns, low bond yields and higher volatility. At December 31, 2017. Source: DC Plans: Greenwich Associates 2016 Institutional DC Trends (survey of the largest tax-exempt funds in the U.S.); Corporate DB Plans/Sovereign Wealth Funds/Endowment & Foundation/Public DB Plans: Cornell University and Hodes Weill & Associates, “Institutional Real Estate Allocations Monitor” (data represents average target real estate allocation among survey respondents, representing 244 institutions in 28 countries, with total assets under management of more than US$11.5 trillion and portfolio investments in real estate totaling approximately US$1.1 trillion across Target Date Funds: Morningstar, based on 20 largest 2030/2035 funds as of 9/30/2018. To help address the need for broader diversification, many investors have turned to REITs and other real estate securities. Since 2005, global assets under management (AUM) in listed real estate portfolios have more than tripled, benefiting from increasing awareness of the historical benefits of REITs and a broader trend toward real return strategies (Exhibit 2). At December 31, 2017. Source: eVestment. A long track record: Most alternatives offer relatively little historical data, limiting the scope of risk-return analysis. By contrast, real estate securities indexes go back 45 years in the U.S. and 28 years globally, providing extensive evidence of the historical long-term benefits to investors. Diversification potential: REITs have historically helped to enhance portfolio efficiency over full cycles, providing strong, low-correlated returns relative to stocks and bonds. Liquidity: REITs trade on public stock exchanges, matching the daily liquidity and pricing needs of most DC plans. Simplicity: Compared with other alternatives, real estate investing is relatively straightforward and transparent, so participants may be more likely to understand and utilize real estate in their portfolio. Real estate has seen a significant shift of capital from private investors to the public market over the past 30 years. This trend of real estate securitization has been driven largely by the emergence of the REIT structure as a viable and efficient way of gaining real estate exposure. 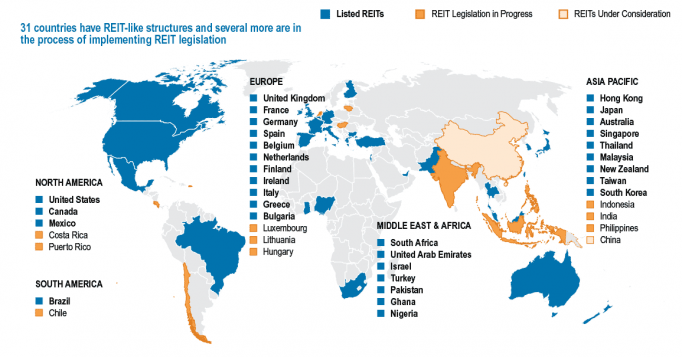 Today, 31 countries have REIT-like securities, and several more are considering REIT legislation (Exhibit 4 on next page). 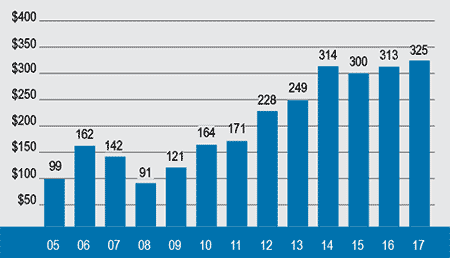 The widespread adoption of REITs has transformed the global real estate securities market, growing it from a $320 billion market in 2002 to $1.7 trillion today (Exhibit 3). About 75% of the market consists of REITs, with the remainder consisting of traditional real estate corporations. With the globalization of listed real estate, investors have a wide range of opportunities in markets with meaningfully different characteristics. At any given time, property markets in each country may offer varying levels of risk and reward potential due to differences in their property cycles, macroeconomic conditions and interest-rate policies. There are also structural differences to consider, as discussed in Exhibit 4. Furthermore, business models and supply-and-demand cycles can vary significantly across property sectors. A company that owns apartments will often have very different cash flow characteristics than one that owns offices. The reason has to do with differences in leasing terms, supply barriers and the specific economic drivers that affect a property’s tenants (see sidebar at top of page 4). Because of the diverse nature of real estate, there is often a wide spread between the best- and worst-performing country and sector over any given period (Exhibit 5). This dispersion creates opportunities for active fund managers to capitalize on different phases of each market’s real estate cycle. At September 30, 2018. Source: FactSet, Cohen & Steers. As represented by the FTSE EPRA/Nareit Developed Real Estate Index. See below for index definitions and additional disclosures. At September 30, 2018. Source: UBS, Cohen & Steers. The U.S. REIT structure has evolved into what we describe as the world’s most efficient real estate operating model. A preponderance of strong corporate governance, transparency, sound business models and a history of effective use of capital has ensured ample access to public equity and debt markets at a generally low cost of capital. The breadth and depth of the U.S. market have made it easier for real estate companies to specialize, providing simple and efficient business models and encouraging market expansion into niche areas such as student housing and data centers. European real estate companies tend to emphasize long leases that are fixed to inflation, resulting in relatively slow but stable cash flow growth. This steady income, combined with high barriers to new supply, has attracted strong investment demand for prime European assets. In recent years, European and U.K. REITs have begun to adopt important reforms, including simplified strategies involving less leverage, less development and a greater emphasis on cash flow. There has also been a shift toward more efficient capital raising, an issue that has somewhat constrained growth prospects in years past. Due to broad economic expansion across the region and a greater emphasis on real estate development, Asia Pacific real estate companies tend to feature relatively high earnings growth. This characteristic is particularly evident in Hong Kong and Singapore. Changes to the Hong Kong REIT code have granted greater flexibility for investment companies to engage in development, although they remain less incentivized to form as REITs due to already- low corporate taxes. By contrast, Australia consists almost entirely of REITs that engage in very little development. All returns and investment characteristics discussed in this report are based on the indexes below. An investor cannot invest directly in an index and index performance does not reflect the deduction of any fees, expenses or taxes. Emerging market (EM) stocks: MSCI Emerging Market Index (net) is a free float-adjusted market capitalization index that is designed to measure equity market performance of emerging markets. Global bonds: Barclays Capital Global Aggregate Bond Index provides a broad-based measure of the global investment grade fixed-rate debt markets. Global real estate/REITs: FTSE EPRA/NAREIT Developed Real Estate Index (net) is an unmanaged market-capitalization-weighted total-return index, which consists of publicly traded equity REITs and listed property companies from developed markets. Global stocks: MSCI World Index (net) is a free-float-adjusted index that measures performance of large- and mid-capitalization companies representing developed market countries. International stocks: MSCI EAFE Index (net) is an equity index which captures largeand mid-capitalization companies in developed market countries excluding the U.S. and Canada. 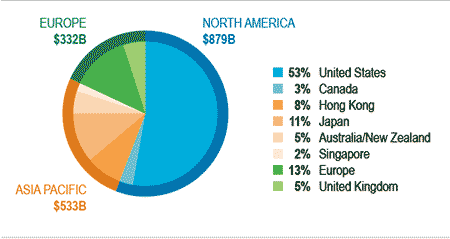 U.S. bonds: Barclays Capital U.S. Aggregate Bond Index is a broad-market measure of the U.S. dollar-denominated investment-grade fixed-rate taxable bond market, and includes Treasuries, government-related and corporate securities, mortgage-backed securities, asset-backed securities, and commercial mortgage-backed securities. U.S. High Yield: Barclays Capital U.S. Corporate High Yield Index covers the universe of fixed rate, non-investment grade debt; Eurobonds and debt issues from countries designated as emerging markets (sovereign rating of Baa1/BBB+/BBB+ and below using the middle of Moody’s, S&P, and Fitch) are excluded, but Canadian and global bonds (SEC registered) of issuers in non-EM countries are included; original issue zeroes, step-up coupon structures, 144-As and pay-in-kind bonds (PIKs, as of October 1, 2009) are also included. U.S. REITs: FTSE NAREIT Equity REIT Index contains all tax-qualified REITs, except timber and infrastructure REITs, with more than 50% of total assets in qualifying real estate assets other than mortgages secured by real property that also meet minimum size and liquidity criteria. U.S. small-cap stocks: Russell 2000 Index measures the performance of the small-cap segment of the U.S. equity universe of the Russell 3000 Index. U.S. stocks: The S&P 500 Index is an unmanaged index of 500 large-capitalization stocks that is frequently used as a general measure of U.S. stock market performance. Data quoted represents past performance, which is no guarantee of future results. The information presented above does not reﬂect the performance of any fund or account managed or serviced by Cohen & Steers, and there is no guarantee that investors will experience the type of performance reﬂected above. There is no guarantee that any historical trend illustrated herein will be repeated in the future, and there is no way to predict precisely when such a trend will begin. There is no guarantee that any market forecast made in this commentary will be realized. The views and opinions in the preceding commentary are as of the date of publication and are subject to change without notice. This material represents an assessment of the market environment at a specific point in time, should not be relied upon as investment advice, is not intended to predict or depict performance of any investment and does not constitute a recommendation or an oﬀer for a particular security. This material is not being provided in a fiduciary capacity and is not intended to recommend any investment policy or investment strategy or take into account the specific objectives or circumstances of any investor. We consider the information in this presentation to be accurate, but we do not represent that it is complete or should be relied upon as the sole source of suitability for investment. Please consult with your investment, tax or legal advisor regarding your individual circumstances prior to investing.